I see the world as a vibrant combination of colors, shapes and pattern. I try to reflect these in my artwork. I love the medium of soft pastel, because of its wonderful characteristics. It allows me to convey what I see onto the surface with luminosity and brilliancy. My desire is to create paintings that are bold and different, inviting the viewers to see things in a different and unique way. Karen Spotts was born in a small farming community southwest of Phoenix, Arizona. Her mother was a major artistic influence, a commercial artist early in life and later a well-known watercolorist. Karen began creating art seriously in high school, having her first one-man show at 17, and exhibiting her work in a Phoenix gallery. After graduating from college in Tempe, Arizona with a degree in Art Education, Karen moved to Los Angeles, and was soon transferred to Denver by a large cosmetic firm. Karen lived in Saudi Arabia for four years, where she re-started her artistic endeavors in the early 1980’s before returning stateside. 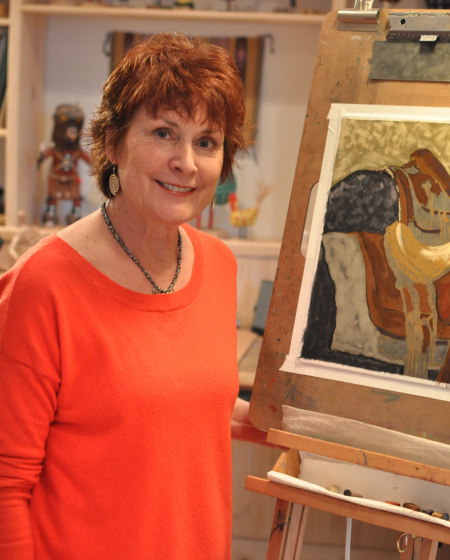 Karen has been an educator for over twenty years, having taught Art at the high school level since 1999. She has raised three children, and is a new Grandma! She currently resides in Evergreen, Colorado, where she finds life relaxing and artistically inspirational, painting in her new studio. Besides painting in her favorite medium of soft pastel, Karen also creates clay prints, a process of pulling monoprints off of a clay slab. In her free time, Karen enjoys traveling, cycling and collecting Native American arts and crafts.